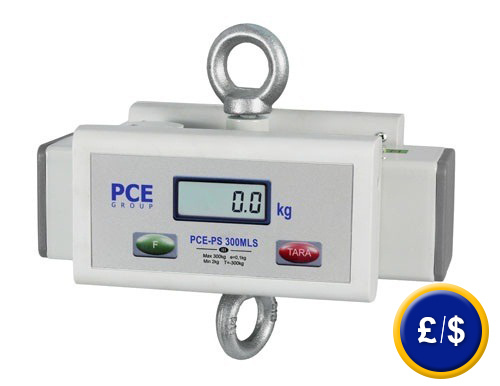 The PCE-PS 300MLS crane scale has a weight range up to 300 kg and can be integrated in your present crane system. The crane scale has an easy-to-use display by means of on/off keys, zero set or tare. The crane scale is powered by mains component or an internal accumulator which are included in the delivery. The internal accumulator operates up to 80 hours. The crane scale is the ideal solution for weighing people who cannot move but there is a necessity to control their weight and no possibility to use a conventional scale. Many crane systems have connections and fixing devices to place a crane scale. The verifiable crane scale can be integrated in many crane systems. Crane scales are necessary in nursing centers and hospitals. The crane scale is sent being already verified. The first verification is valid for two years but every other verification is valid only for one year and must be done annually. Here you will find an overview of all the crane scales available at PCE Instruments. If you have any questions regarding our crane scales, please contact us and our engineers and technicians will help you find the crane scale which suits your needs. The kit includes a software for transferring the weighing data to a PC or Portable and RS-232-cable. The transferred data can also be sent to other software such as Excel, etc. The standard software is in English (other languages are also available: French, German, etc).